Giemsa banding patterns of chromosomes in seven Rattus species were compared. Four species (R. rattus tanezumi, R. norvegicus, R. exulans and R. muelleri) had all 2n=42 and their karyotypes and banding patterns were similar, although slight differences were observed. Another subspecies (R. rattus rattus) and two other species (R. fuscipes and R. conatus) had fewer chromosomes than the above species by having large biarmed chromosomes developed probably by Robertsonian fusion. 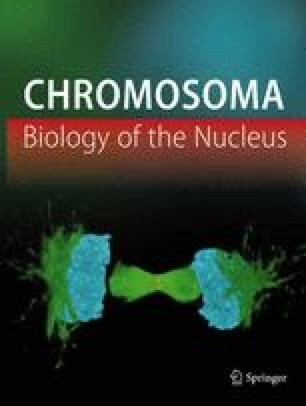 The origin of the arms of biarmed chromosomes was recognized by their characteristic banding patterns. The remaining species, R. sabanus, had a karyotype markedly different from the other species by having two small metacentrics although in the others their number was 7. Banding patterns of the chromosomes in this species, however, were also very similar to those of the other, and therefore the 7 small metacentrics seemed to have originated by pericentric inversion of small acrocentrics. Contribution No. 912 from the National Institute of Genetics, Japan. Supported by a grant-in-aid from the Ministry of Education of Japan, Nos. 90183, 90375 and 744002.